Nuts are an excellent source of nutrients, fiber, and healthy fats. Almonds, in particular, taste great and can be used as a snack or added to foods like salads, yogurt, ice cream, rice, legume dishes, or cottage cheese. I find that fresh almonds have a characteristic sweetness that most types of nuts do not have so I love to eat them on a regular basis. The question remains, however, whether eating almonds can help with weight loss. New research published in The European Journal of Clinical Nutrition looked at the relationship between the consumption of almonds and body weight, blood sugar, appetite and fasting blood measurements in participants who consumed almonds with food or alone as a snack. The researchers placed 137 subjects into four randomized groups. Each group consumed either 43 grams (1.5 ounces) of almonds with breakfast, lunch, alone as a snack, or not at all. The researchers discovered that almond consumption lowered post-meal blood sugar responses especially if they were eaten alone as a snack. Those participants who ate the almonds as a snack alone also experienced less hunger and a desire to eat during subsequent meals. 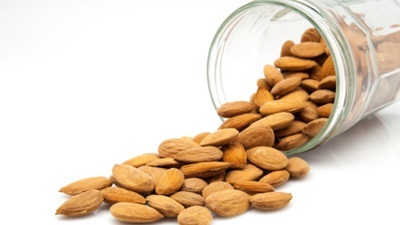 After the four-week trial, none of the participants who ate almonds gained weight.The subjects who ate the almonds also showed higher levels of omega-9 fat and vitamin E intakes compared to the control group. This study indicated that the consumption of almonds especially as a snack does not lead to weight gain and can actually provide positive benefits which can affect hunger, feeding behaviors, and nutrient levels in your body. The omega-9 fats have been shown to improve insulin metabolism, lower blood pressure, inflammation, and reduce the incidence of heart disease. I add fresh almonds to my oatmeal, cottage cheese, yogurt and I also like to add them to my rice and legume dishes. Almonds can make a great stand alone snack as well. Try adding some other nuts to the mix with some dried fruit. Also, if you want to replace peanut butter with something even better, try almond butter! It has a great taste and it even make a better sandwich with bananas than peanut butter! Mattes, R., et al., “Appetitive, dietary and health effects of almonds consumed with meals or as snacks: a randomized, controlled trial,”European Journal of Clinical Nutrition. Published online October 2, 2013.